Boron doped polycrystalline diamond tip coating, 100 nm thick; Aluminum coating on detector side of the cantilever, 30 nm thick. 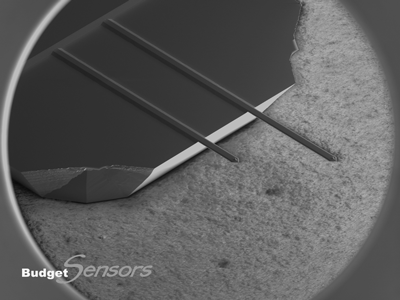 Versatile monolithic silicon AFM probe with 4 different cantilevers on a single AFM holder chip for various applications: contact mode, force modulation mode, soft tapping mode and high frequency tapping / non-contact mode and electric modes such as: scanning capacitance microscopy (SCM), electrostatic force microscopy (EFM), Kelvin probe force microscopy (KFM), scanning probe lithography and conductive atomic force microscopy (C-AFM). The doped polycristalling diamond tip coating provides unprecedented hardness and durability, as well as electridcal conductivity for demanding electrical applications. The resulting tip radius is in the range 100-300nm. The rotated tips allow for more symmetric representation of high sample features. 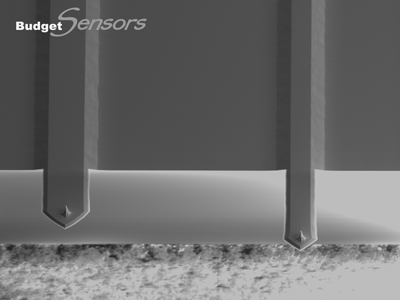 The main advantage of this product compared to regular, single-cantilever AFM probes is the freedom to choose the right cantilever for each application in the very last moment. 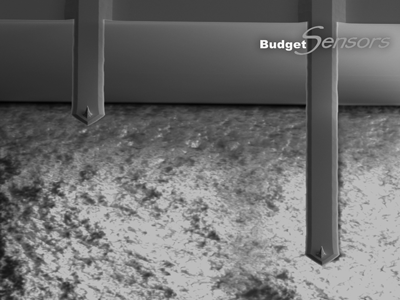 You do not need to stock various AFM probe types any more. 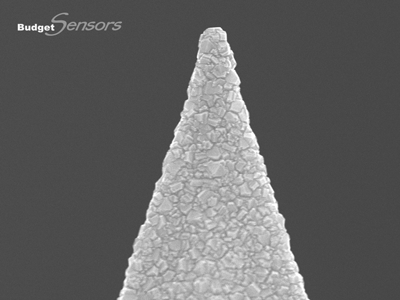 Nevertheless, this product is not meant as a substitution to comparable single-cantilever AFM probes, because the geometry of each one of the All-In-One cantilevers differs from the geometry of the comparable specialized single-cantilever AFM probes. Please note that the aluminum back side coating is not suitable for measurements in liquids!